A thousand thanks to everyone who has written to ask if I am all right. I am. It came within about half a mile, we had to evacuate for most of last week, but we are home now. My son and I were talking about Santa Ana winds yesterday--about how they scrape at the human nervous system. They have always made me uneasy. When he was little, he said, the winds were exciting, like there was some adventure coming, something just over the hill, something you had to be ready for. The humidity was 5% for about three days--wind gusts peaked around 70 mph, consistently 25-40 mph. There were three days of a ruddy false twilights that came and went as the wind shifted, three nights of a vivid orange moon and fire outlining the shapes of ridges. Over half a million people were evacuated. Many are not yet home. Some will come home to rubble. We are in the second year of a dust and bones drought--which was preceded by a really rainy year. That year grew the thickets of brush and weeds that are now brittle, dry and still burning in sweeping fronts all over southern California. It is still smoky at times, as the air shifts. It is just before sunrise here and I went outside and walked around to wake up--something I usually do--and saw clouds here and there--so the humidity is coming back up. I can see the glow on Palomar Mountain off to the east, too, and the smell of smoke is on the breeze coming from the northwest. So the Poomacha and Rice/de Luz fires are still alive. The Santa Ana winds, we are told, could rise up again over the next few days. Some places, that would actually help--driving the flames back toward the already-burned land. Other places, it could enlarge existing fire areas. NBA finalist?? 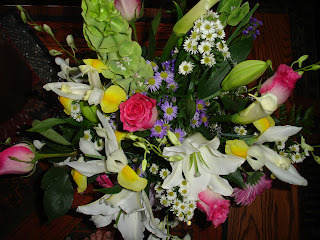 Thank you, S&S for the gorgeous flowers!! 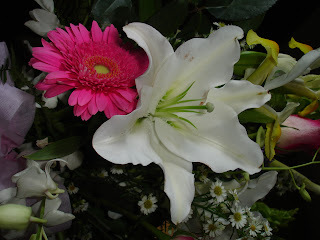 The bouquet is huge, sweet and beautiful. I am just overwhelmed and I still can't quite believe it. And there's this, too: As I work madly on the next book--Sacred Scars--I am feeling bolder and reckless and strong--that feeling you get after you jump over a fire, and land safe. But in the same instant, I am afraid (and by afraid, I mean terrified) that it was a fluke. Newsflash: Writers are endlessly nutty. The call came yesterday--now that the press release is out, I can talk about it. And if I had had ANY idea this might happen, I would never have written about my septic tank on this blog a few days ago. Writing like crazy. No. Really. Like crazy. I am late with the second volume of A Resurrection of Magic. Long story why, there are personal and other reasons. Most recent (yesterday) and funniest: my septic tank died. I will spare you the details. No, I won't. It is ten long strides away from my office. Machinery, people digging ditches, yuckiness, olfactory torture and $ leaving my hands--all this is in my future. The title came to me though. Finally. 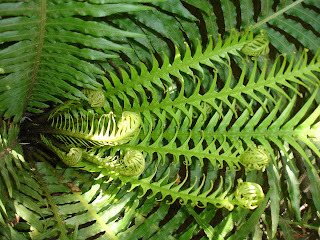 And it came to me when I was staring down the throat of this fern, enchanted/dizzy. It fits perfectly. Ferns are very wise. It took me half a day to realize that Sadima's home, the little hill farm village in the book is called...Ferne. It made me shiver, realizing that. When the story is dragging the writer along by her subconscious...that is usually when it is truly working. back to writing. A thousand kisses to everyone writing to me about Skin Hunger. 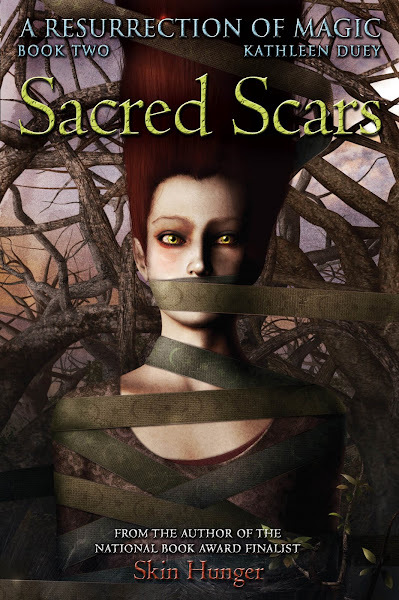 I am hurrying and I think Sacred Scars will be worth the wait.